In November, two young string players from Soweto, Johannesburg, joined Chetham’s for a week – living and studying alongside fellow students from Year 8. 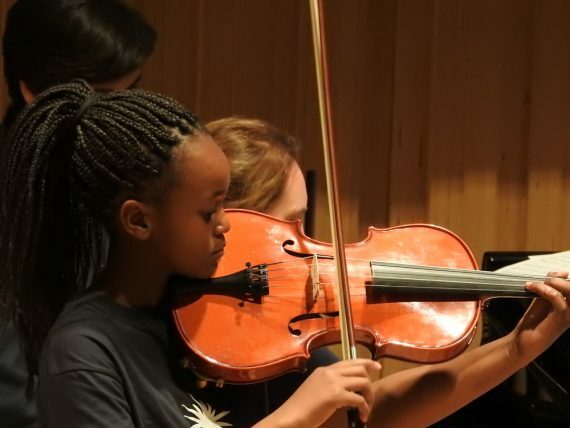 Viola player Kwanda Buthelezi, 13, and violinist Mbali Phato, 12, boarded with younger students in Victoria House and took part in academic and music lessons and evening activities including Scouts. At the end of the week, they played alongside Chetham’s Sinfonia in a sold-out performance of Tchaikovsky’s The Nutcracker, conducted by Director of Music Stephen Threlfall with storytelling by Head Alun Jones, in Chetham’s stunning Stoller Hall. Kwanda and Mbali came to Manchester as part of Arco, an alliance between the Royal Birmingham Conservatoire and Cape Gate MIAGI Centre for Music in Soweto. The partnership allows young players from a deprived township in South Africa to access video lessons with Conservatoire teachers on a regular basis, culminating each summer in a music festival in South Africa led by music teachers from the UK. This year, the project was extended to include the Arco Exchange, through which Chetham’s violin tutor Jan Repko led a teacher training programme with Arco teachers, and through which the girls’ visit to Birmingham and Chetham’s was arranged. The exchange was a fantastic opportunity for students from both Soweto and the UK, as they spent the week learning about teaching methods, life and music in one another’s countries. Kwanda and Mbali were ably looked after by current Year 8 students, who helped them quickly adapt to life here at school, navigating timetables and our buildings. Special mention should be made of Margot Field, who took the lead on making sure they were fully involved in all aspects of school life! The girls certainly made the most of the Victoria House hoodies they were given as presents to keep them warm during their week in a very wintry Manchester. Kwanda and Mbali also joined 1st Chetham’s Scout group for an evening, giving a presentation on life in Soweto and what their experiences of learning music is like there. They even took 1st Chetham’s neckers home with them as a thank you! It was a particular pleasure that their visit took place in a week when a major concert was already planned, giving the whole group a chance to cement their friendships through a shared performance.